The original purpose of this blog? To explain how I put gently used books into the hands of students in order to improve reading. Classroom libraries with a wide variety of books-new and used- are critical to engaging readers. The name of the blog, Used Books in Class, was initially chosen to indicate the condition of the texts. The term “used”, however, can also serve to mean how these text are used in my class. In other words, how are the used books being used in the English Language Arts Classrooms at each grade level? In writing this blog, I have found myself increasingly commenting on other related issues in education: Common Core, standardized testing, curriculum, technology, teacher training. This means the purpose of the blog has grown to include topics in education as well as reading. As the English Department chair (and Social Studies Chair and Chief Academic Officer), I looked for was to expand our book collections at minimal cost. Starting in July of 2010 and continuing through June 2014, I added books to Regional School District #6 (Litchfield, CT) Wamogo Middle/High School classrooms including independent reading selections and core novels. 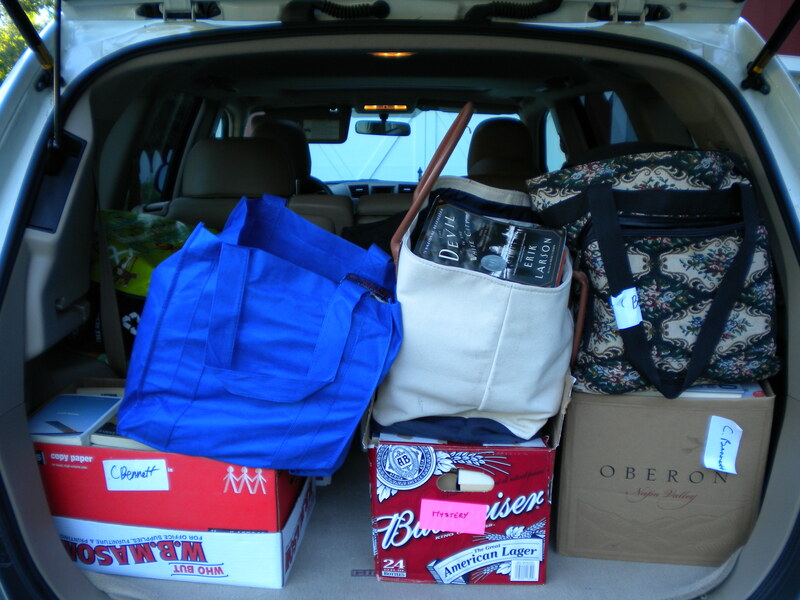 The first year (June 2010-2011) I added well over 2,500 books for less than $2,000.00 by shopping at thrift stores or at seasonal public library book sales! I accepted a position in West Haven, Connecticut, as the Coordinator of Language Arts, Social Studies, Library Media, and Testing beginning in September 2014, and once again I immediately began rounding up books for the middle school classroom libraries. The first “haul” was 238 books for $220.00. –Used books have replaced copies at each grade level. Used books have been used to replace lost or damaged copies of books assigned to a particular curriculum. For example, there have been replacement copies of The Giver for Grade 7, Of Mice and Men in 9th grade, and Animal Farm in Grade 10. These titles are taught in almost every school system in Connecticut, and are titles that are relatively easy to find locally in the secondary market. -Used books have increased selections for independent reading in classrooms. Expanding classroom libraries allows students at each grade the opportunity to choose the books they want to read. Students may choose a book from the school’s library media center, or choose a book from one of the carts in the classroom. Titles may vary in genre, subject and reading level in order to meet student interest. -Used books are added titles as “satellite texts”. English teachers can have extended thematic units to include titles that complement a text from the literary canon. For example, a thematic unit “Coming of Age” is usually associated with Salinger’s Catcher in the Rye. Purchasing used books have increased selections to include Sittenfield’s Prep, Cormier’s The Chocolate War, Lamb’s She’s Come Undone, Gibbons’s Ellen Foster, and Chbosky’s Perks of Being a Wallflower. Students select a text to explore the thematic idea through the lens of another author. -Used books can be used to adopt core texts. The purchase of used books has expanded curriculum at several grade levels with high interest titles. 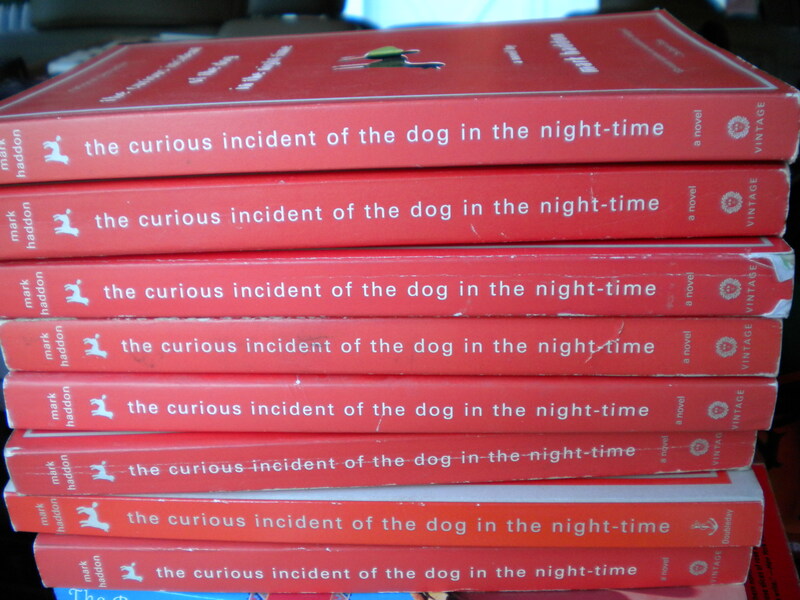 For example, Hosseini’s The Kite Runner, Coelho’s The Alchemist and Haddon’s The Curious Incident of the Dog in the Night-time (see picture) have been added to the World Literature curriculum in grade 10 or Farmer’s The House of the Scorpion for grade 7. Mrs. Bennett–I hope everything is ok. My stomach has been upside-down ever since hearing about what happened. Hopefully you and the people around you have managed and will continue to manage to stay strong throughout this. My condolences to anyone and everyone in your circle that is feeling this pain moreso than myself. Yes, I am fine, but only because I am teaching in Litchfield, CT (Wamogo High School). I do appreciate your concern. The Newtown tragedy does send a shiver into teachers everywhere who feel responsible for the intellectual development of their students…and now for their physical safety as well. I know that my faculty went home very somber today knowing there is a group of children in Newtown who will always miss their 20 classmates throughout the years they spend in elementary, middle, and high school. Thank you again for your concern….and I hope all is well with you. What is the Grade 12 memoir class? An entire semester class about memoirs?? Our 12th grade English is organized in electives. For the past two years, this was one elective. This coming year, the memoir class will be a quarter. What a wonderful idea! If you want a copy of my memoir (free) for yourself or your students, please let me know. My parents were both teachers, so would love to help an educator and kids. How do I get $ back to you? ?